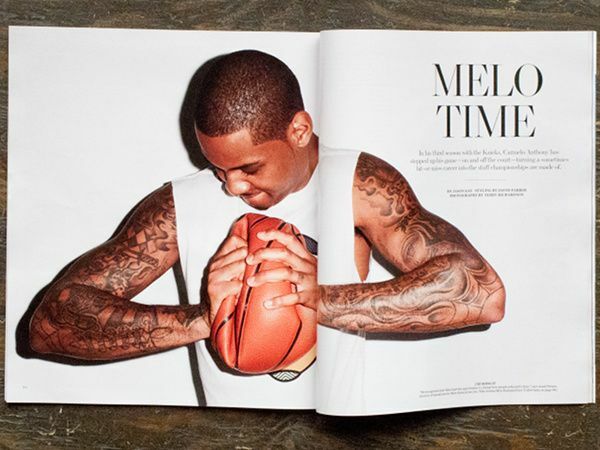 Talked with Carmelo's team about doing a story for a while, found an angle in a one-off collaboration with fashion brand Rag & Bone, brought it to Terry to see if he'd want to shoot him, moderated conversation with Melo and Rag & Bone designers Marcus Wainwright and David Neville. Some of the most fascinating choices in menswear aren't found on Milanese runways or some Scandanavian style blogger's sponsored Pintrest page, but at NBA post-game press conferences. There's a long history of sports celebrities being style icons, but recently professional basketball players have been taking it to another level, not just with bold apparel moves that make valid contributions to the fashion dialogue, but by integrating themselves into the fashion industry itself. 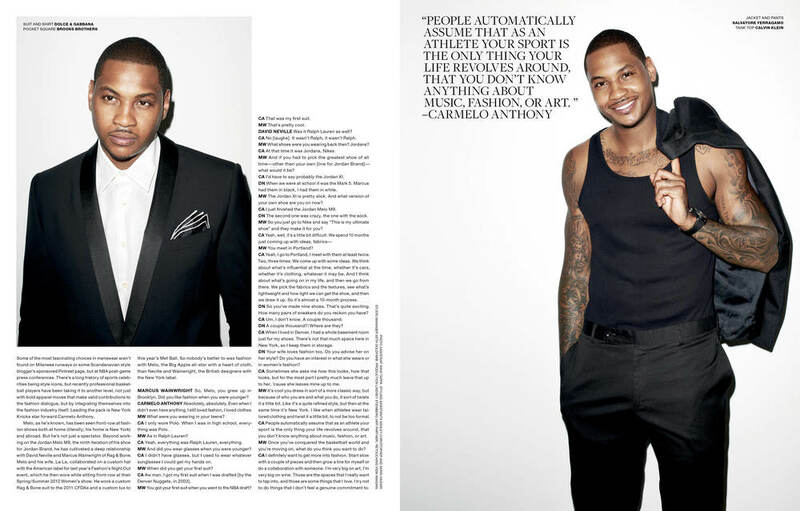 Leading the pack is New York Knicks star forward Carmelo Anthony. Melo, as he's known, has been seen front-row at fashion shows both at home (literally—his home is New York) and abroad. But he's not just a spectator. Beyond working on the Jordan Melo M9, the ninth iteration of his shoe for Jordan Brand, he has cultivated a deep relationship with David Neville and Marcus Wainwright of Rag & Bone. Melo and his wife, La La, collaborated on a custom hat with the American label for last year's Fashion's Night Out event, which he then wore while sitting front-row at their Spring/Summer 2012 Women's show. He wore a custom Rag & Bone suit to the 2011 CFDAs and a custom tux to this year's Met Ball. So nobody's better to wax fashion with Melo, the Big Apple all-star with a heart of cloth, than Neville and Wainwright, the British designers with the New York label. MARCUS WAINWRIGHT So, Melo, you grew up in Brooklyn. Did you like fashion when you were younger? CARMELO ANTHONY Absolutely, absolutely. Even when I didn't even have anything, I still loved fashion, I loved clothes. MW What were you wearing in your teens? CA I only wore Polo. When I was in high school, everything was Polo. MW As in Ralph Lauren? CA Yeah , everything was Ralph Lauren , everything. MW And did you wear glasses when you were younger? CA I didn't have glasses, but I used to wear whatever sunglasses I could get my hands on. MW When did you get your first suit? CA Aw man. I got my first suit when I was drafted [by the Denver Nuggets, in 2003]. MW You got your first suit when you went to the NBA draft? CA That was my first suit. DAVID NEVILLE Was it Ralph Lauren as well? CA No [laughs]. It wasn't Ralph, it wasn't Ralph. MW What shoes were you wearing back then? Jordans? CA At that time it was Jordans, Nikes. MW And if you had to pick the greatest shoe of all time-other than your own [line for Jordan Brand]what would it be? CA I'd have to say probably the Jordan XI. DN When we were at school it was the Mark 5. Marcus had them in black, I had them in white. MW The Jordan XI is pretty slick. And what version of your own shoe are you on now? CA I just finished the Jordan Melo M9. DN The second one was crazy, the one with the sock. MW So you just go to Nike and say "This is my ultimate shoe" and they make it for you? CA Yeah, well, it's a little bit difficult. We spend 10 months just coming up with ideas, fabrics. MW You meet in Portland? CA Yeah, I go to Portland, I meet with them at least twice. Two, three times. We come up with some ideas. We think about what's influential at the time, whether it's cars, whether it's clothing, whatever it may be. And I think about what's going on in my life, and then we go from there. We pick the fabrics and the textures, see what's lightweight and how light we can get the shoe, and then we draw it up. So it's almost a 10-month process. DN So you've made nine shoes. That 's quite exciting. How many pairs of sneakers do you reckon you have? CA Um, I don't know. A couple thousand. DN A couple thousand?! Where are they? CA When I lived in Denver, I had a whole basement room just for my shoes. There's not that much space here in New York, so I keep them in storage. DN Your wife loves fashion too. Do you advise her on her style? Do you have an interest in what she wears or in women's fashion? CA Sometimes she asks me how this looks, how that looks, but for the most part I pretty much leave that up to her, 'cause she leaves mine up to me. MW It's cool you dress in sort of a more classic way, but because of who you are and what you do, it sort of twists it a little bit. Like it 's a quite refined style, but then at the same time it 's New York. I like when athletes wear tailored clothing and twist it a little bit, to not be too formal. CA People automatically assume that as an athlete your sport is the only thing your life revolves around, that you don't know anything about music, fashion, or art. MW Once you've conquered the basketball world and you're moving on, what do you think you want to do? CA I definitely want to get more into fashion. Start slow with a couple of pieces and then grow a line for myself or do a collaboration with someone. I'm very big on art, I'm very big on wine. Those are the spaces that I really want to tap into, and those are some things that I love. I try not to do things that I don't feel a genuine commitment to.